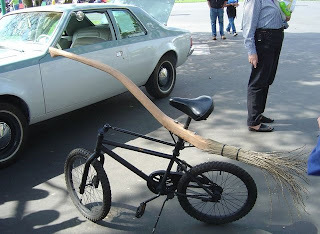 I know the posts have been a little sparse lately (I blame my real job), but here's something I just had to make sure got out before Halloween - yup, that's a bike modified to be a witch's broomstick. At first glance, you may not think it's possible to steer - but look carefully, and you'll see that the broom itself is linked to the front wheel. Definitely clever, but I'd love to see a wannabe witch try to actually ride this thing! Happy Halloween, readers!